The elegance of romantic views! The Grand Hotel Toplice is located on the shore of Lake Bled, from where you can admire the loveliest views of the lake, Bled Island and Bled Castle. Step into the hotel with the longest tradition in Bled and listen to the stories whispered by the rustic parquet beneath your feet and emanating from the romantic furniture with a history spanning over 80 years. Let yourself be taken to a world where time passed slower. The healing thermal spring murmuring below the hotel and the beds customised to offer you the maximum comfort will lull you into a restful sleep. Just like so many eminent guests before you. You will feel the sense of tradition and a special charm upon first setting foot in the hotel and your very first contact with the receptionist. Give your story time to be written in the history of our hotel in capital letters. The Grand Hotel Toplice, the most famous Bled hotel, is located by the shore of Lake Bled. It offers 87 rooms, including 28 suites and a presidential apartment. All the rooms have air conditioning and suites with a view of the lake have a balcony. The beds in the rooms and suites with a view of the lake include mattresses with automatically adjustable firmness. The hotel provides a selection of pillows to taste. The bathing site within the hotel is filled with natural thermal water from its own spring. The boutique Spa Luisa wellness comprises a thermal pool, a massage tub and saunas, and offers a range of massages and beauty treatments. Since 2009, the Grand Hotel Toplice has been the only Slovenian hotel member of the international Small Luxury Hotels of the World. The Grand Hotel Toplice has three hotel restaurants. The à la carte Julijana Restaurant (open every day from 19.00 to 23.00) is a boutique restaurant offering local and international seasonal dishes. The Grand Restaurant offers traditional meals upgraded with local and seasonal ingredients. Breakfast is served from 7.00 to 11.00, lunch to order, and supper is between 19.00 and 22.00. The hotel has a bar (8.00–24.00), which serves drinks in the Lake Lounge and the Presidential Lounge. In the summer season, the Jezero Lounge is open on the hotel terrace right next to the lake (11.00–21.00) with a range of refreshing smoothies, a long wine list, light snacks and desserts. Room service is available 24/7. The hotel features a small wellness centre – Spa Luisa with a pool and a thermal water spring (22 degrees). The Grand Hotel Toplice has its own outdoor lake bathing site. Opening hours of Spa Luisa: pools and saunas from 7.00 to 20.00. In addition to a pool, the relaxing Spa Luisa at the Grand Hotel Toplice offers guests saunas and a wide range of massages, baths and beauty treatments. 3.5 km from the hotel is the Royal Bled Golf Course, comprising the 18-hole King’s Course and the 9-hole Lake Course. In addition to the two courses, there are a large practice area, a Golf School, a golf equipment shop, wardrobes for guests and a storage room for equipment. The course also hosts the King's Club House. During the season (March–November), the golf course is open from 7.00 to 22.00, while in the spring and autumn the opening hours depend on the sunrise and sunset. The Grand Hotel Toplice is known for its supreme organisation of the most demanding business, training, social and protocol events. Five conference halls cover 800 m2. The largest facility for hosting events is the multi-purpose Grand Hall (326 m2, seating up to 270 people). The hotel also includes the multi-purpose Panorama Hall (213 m2 with 150 seats) I, II and III, and the Presidential Lounge is occasionally employed for congress services as well. The Grand Hotel Toplice is located right next to Lake Bled. Leave the motorway leading to Ljubljana at the Lesce–Bled exit. At the first roundabout, take the second exit. Continue straight on until you reach Bled. At Bled, descend the slope to the lake and you will find the Grand Hotel Toplice on the right next to the lake. It is 54 km to Ljubljana, 144 km to Trieste, 290 km to Venice, 360 km to Munich, 220 km to Graz, 378 km to Vienna, 515 km to Budapest, 198 km to Zagreb and 588 km to Belgrade. The closest airport is the Jože Pučnik Airport 35 km away. The Klagenfurt Airport is 65 km away. The closest bus stop is 800 m away, while the railway station is 3.3 km from the hotel. Elegant double room with balcony characterised by the traditional luxurious style of the hotel. The room (22 - 25 m2) with a 180 cm wide bed features a bathroom with bathtub or shower and toilet as well as a desk. 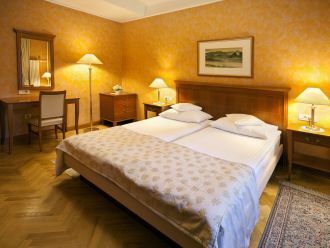 Elegant and comfortable double room in the traditional historical style with a balcony overlooking Lake Bled. The room (22 - 25 m2) with a 180 cm wide bed features a bathroom with bathtub or shower and toilet as well as a desk. 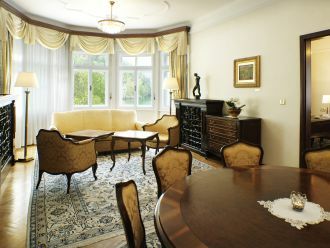 Elegant and spacious suite in the unique rustic style of the hotel with a balcony overlooking Lake Bled. The room (46 - 65 m2) with a 180 cm wide bed features a bathroom with bathtub, shower and toilet as well as a desk and sofa set. 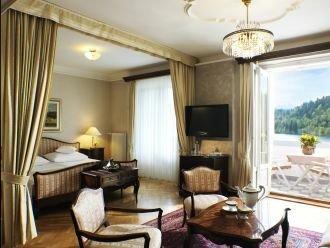 An elegant and comfortable three room suite with a balcony featuring views of Lake Bled, the castle and the Alps for vacation worthy of a president. The traditional splendour of a suite (93 m2) offers a living room with a sofa set and dining table, bedroom with a 200 cm wide bed, bathroom with shower, jacuzzi and toilet as well as a room with a desk. Comfortable room with a balcony for single guests who mainly desire peace and quality rest. The room (13 - 15 m2) with a 90 to 140 cm wide bed features a bathroom with shower and toilet as well as a desk. One of the most beautiful hotels I have ever stayed in. Delicious food, staff are lovely and rooms are very comfortable. Traditional slovenian music in the restaurant at breakfast and dinner we found particukarly lovely. Christmas decorations were a big hit with the children and they even found a gift outside their door on Christmas morning. Views of Lake Bled were gorgeous and the children went ice skating close by. Stayed: December 2016, traveled with family. Nearly a century of stories written at the Grand Hotel Toplice are alive on the banks of Lake Bled – a “serene paradise”. Write your own! High society is still very much alive at the Grand Hotel Toplice. The day starts with breakfast made of fresh seasonal ingredients. Then follows readi ...ng a newspaper in the Lake Lounge while enjoying a morning cup of coffee, or perhaps a glass of champagne on a wooden deckchair on the private lake beach and a light lunch with a view of the lake. Rest. In the afternoon, it is time for tea in the hotel lounge with a magnificent view. After supper, made by one of the top chefs in Slovenia, comes a glass of sherry and a talk accompanied by gentle melodies from the pianist. Relaxing rituals. Inspiring rituals. Rituals with the best view. Grand Hotel Toplice is a hotel on the shore of Lake Bled with a private beach and a pier. Your personal paradise on the lake shore is complemented by ...butler service. If there is anything more romantic than a view of Bled Island and the neighbouring peaks, it is the view of Lake Bled and the neighbouring peaks from a wooden boat. All our boats are made according to local tradition by a local boatman, who builds an immense love for wood and this hometown into every boat. The boats are available to guests of the Grand Hotel Toplice free of charge at the hotel boathouse. You can treat yourself to a proper picnic on a boat. 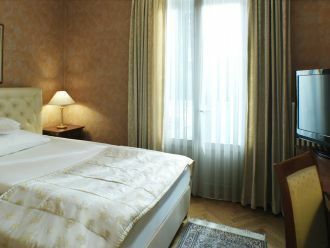 What makes Grand Hotel Toplice a boutique hotel is that its treasures are enjoyed only by the select. Few people know that at the centre of the hotel ...is a spring of healing thermal water. Its virgin spring water fills indoor pool early every morning. A refreshing swim in the pool is believed to have a beneficial effect on the health of the heart and vessels. Regular guests are convinced of the positive effects of treatment by drinking – pour yourself some fresh thermal water from the spring and enjoy its beneficial effect on the intestines and internal organs. Our small health rituals! A wide staircase descending to the hotel wellness Spa Luisa takes you into a world co-created by the magnificent views of Lake Bled, relaxing wellness ... rituals and exclusive hotel saunas. With its thermal baths, Spa Luisa is also a venue for small private parties in celebration of the most beautiful moments of one's life – engagements, bachelorette parties and favourite anniversaries. The private terrace of Spa Luisa is at its best in the evening, when it is lit by numerous lamps shining on the lake surface like stars. Breakfast, lunch and supper at Grand Hotel Toplice are not just another meal, albeit a tasty one. They are a ritual that we have perfected over the ce ...nturies. They are supervised by one of the top chefs in Slovenia and the drinks matching them are mixed by a World Cocktail Vice-Champion. Culinary fans should try a romantic dinner at the hotel’s á la carte Julijana Restaurant with the magnificent view of Lake Bled. A special event is the Chef's Table – the hotel chef will lay the table in the midst of the shining kitchen counters and polished saucepans of the Grand Hotel Toplice kitchen. In the 18th century, two thermal springs were discovered along the lake shore and they were believed to have beneficial effects. Next to them, Luisenb ...ad was constructed – the predecessor of today's hotel. From the very start, this was where high society gathered and where guests were offered thermal baths and treatment by drinking. After the end of World War I, the hotel was bought and renovated by an ambitious local, Jula Molnar. She renamed it Toplice. The hotel gained the reputation of the most luxury hotel between Vienna and Budapest. After World War II, it again became the juncture point of political, cultural and social life, and its elegance and supreme services once more attracted the cream of the world and famous personalities. They say Bled is magical, so it is no coincidence that it is a very popular wedding venue. Couples in love come here from all over the world to seal t ...heir love and take their vows in this fairy-tale setting. A wedding at Bled’s Grand Hotel Toplice gives the romantic event a twist of elegance and a view of one of the most romantic settings in the world – a serene paradise, portrayed for the wedding guests and newlyweds by Lake Bled. Sava Hotels Bled merge a modern business climate and diversity in harmony with nature. The hotel conference centre with facilities in 6 hotels offers ...everything you need for the perfect execution of a business event with an environentall-friendly note: from a broad selection of state-of-the-art conference facilities to restaurants, bars and shops featuring a top-level culinary offer. Out of the 26 different conference spaces, you are sure to find the one that will give your business event a unique feel in the embrace of the creative atmosphere of Lake Bled. The specialised team of MICE experts at Sava Hotels Bled will listen to your every wish and make sure that the event is a one of a kind experience. 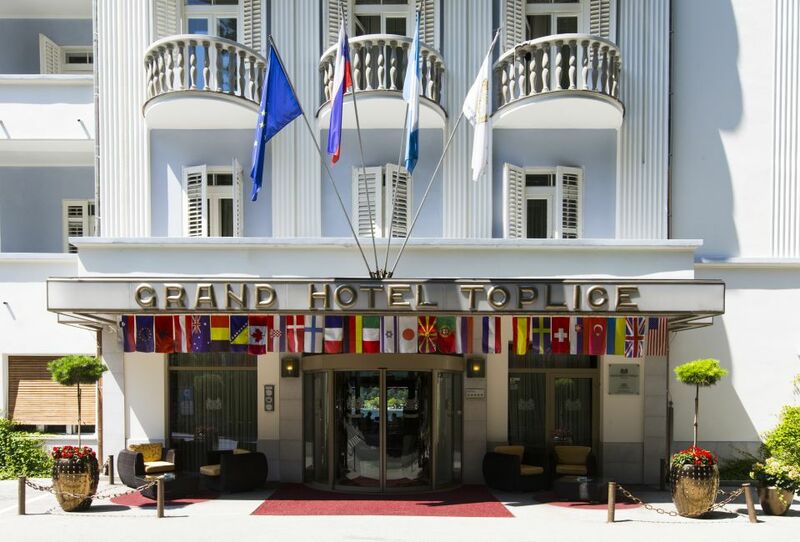 Grand Hotel Toplice is a member of the Small Luxury Hotels chain, which combines small hotels providing unique personalised services and inspiring experiences, forever leaving an imprint on the guests' memory. The character of Grand Hotel Toplice is reflected in small treasures and great stories, which have become a part of the hotel through the centuries. Owing to numerous works of art, the hallways of the hotel resemble an art gallery. Everything at the hotel bespeaks of the lovely moments that guests spent here. We will do our utmost for your story to never be forgotten!